Iran has arrested more than 100 Christians in the last week, charities report, amid a growing crackdown by the Islamic Republic. They had to report the history of their Christian activities and were told to cut contact with any Christian groups, according to Open Doors UK, a charity which speaks out on persecution against Christians. While Christianity has existed in Persia since Christ’s death, many believers fled after the Shah was deposed in a coup and Ayatollah Ruhollah Khomeini was installed in the Islamic revolution of 1979. 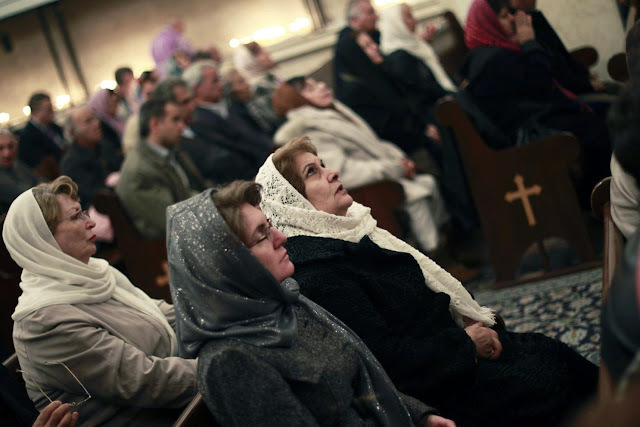 There are no official records, but there are estimated to be some 350,000 remaining in Iran - some one per cent of Iran’s population, with a rising trend toward converting to Christianity. Christian advocacy groups report a growing underground evangelical movement in Iran, where they say increasing numbers of people who have become curious about the minority religion. While worship is permitted under the Islamic Republic’s constitution, conversion to Christianity can be a crime meriting a sentence of more than 10 years imprisonment. Iran’s powerful mullahs are committed to expanding the influence of Shia Islam and blame “foreign influence” for the conversions. “There are many reports that this has contributed to the government’s ever-increasing dependence on hardline Islamic ayatollahs, who naturally see Christianity as a threat to their power,” Jeff King, president of International Christian Concern. “For this reason, it’s not surprising that we’re seeing an increase in Christian persecution.” It has become increasingly common for authorities to arrest worshippers, raid house churches, and confiscate Bibles. At the end of September, Christians Saheb Fadaie and Fatemeh Bakhteri were also sentenced to 18 and 12 months in prison, respectively. The two men were found guilty of "spreading propaganda against the regime," apparently for preaching about the ascendancy of Jesus Christ. “This spike in arrests is highly concerning,” said Zoe Smith, head of advocacy at Open Doors. “It follows an established trend of the Iranian government – as the number of converts to Christianity increase, so the authorities place greater restrictions on churches. She warned that some Christians disappear from their communities after serving prison sentences. “Church leaders are put under pressure to leave the country or face an arrest,” she said.